You might have noticed it already… I am a big fan of rooftop bars! Whatever city I visit, I always want to see it from above, ideally from the top of a roofbar. Same as in Melbourne, I also found a very nice one in Paris, making up the perfect finish of a wonderful day in Montmartre. 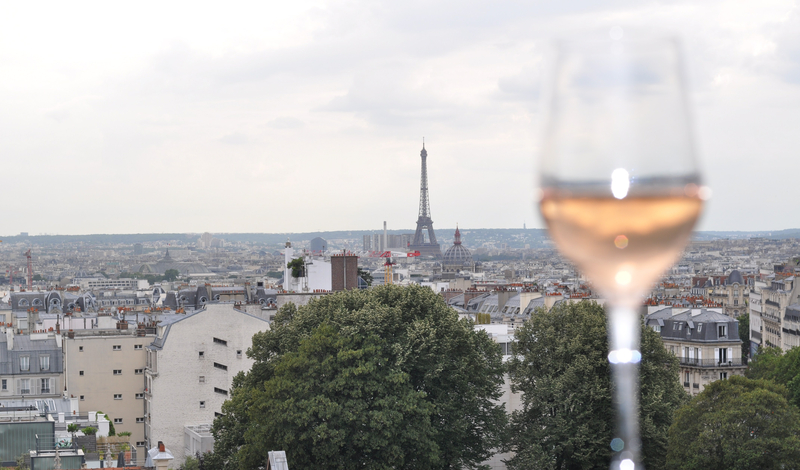 From Terrass Hotel rooftop I enjoyed a magnificent view over Paris, including its landmark, the Eiffel Tower. Terrass Hotel is located close to the cimetière Montmartre, where quite a few famous people are buried. A cool refreshing drink or a sundowner in this pleasant rooftop bar can thus be the crowning conclusion of an eventful day in Montmartre. Sacré Coeur: the Catholic Church is the landmark of Montmartre and one of the most visited sites of Paris. Place du Tertre: if you wish to have a portrait of yourself, this is where you find painters to do so. For a little coffee thirst in Montmartre I can recommend Café Tabac in 1bis Rue Ravignan, 75018 Paris. It is a very tiny place, but with a fantastic coffee and also some snacks and sandwiches for lunch. Montmartre, which is in the 18th arrondissement of Paris, is definitely worth spending a couple of hours there! Enjoy your day in Montmartre!